Interventional cardiology has evolved on a rapid and broad front in the last 20 years. Coronary intervention is now established with well designed and functional equipment. Some aspects of non-coronary intervention are long standing such as balloon valvuloplasty on aortic, pulmonary and mitral valves and the technology and techniques are mature in these small areas. Defect closure has developed and the treatment has become the first choice for such patients. However valve disease is a major cause of morbidity and mortality in our aging population and becoming a major health problem. The enclosed work considers the non surgical approaches that are available. Percutaneous aortic and mitral valve interventions are likely to be the future of the management of valve disease, as are electronic books. Historically, patients with advanced structural heart disease have required major surgery to correct the defect. This includes for example, patients with atrial septal defect, aortic valve disease and mitral valve disease. In recent years there have been major advances in the treatment of patients with structural heart disease using minimally invasive, percutaneous treatments. This field continues to evolve quite quickly. 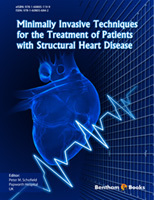 This e-book outlines the current situation in respect of the minimally invasive treatment of a wide range of structural cardiac defects. As the technology continues to develop, we aim to modify the book to keep-up-to date with new developments. In each chapter we aim to cover details of the structural defect in question and outline the various technologies available for treating the condition. We include the indications for the procedure as well as providing details of the procedure itself. Finally, we present the outcomes of the use of the devices. The clinical presentation of patients with a patent foramen ovale is described. The imaging techniques used for this condition are discussed. An important area is the indications for percutaneous closure of PFO, and also selecting patients who do not need to have a closure device. The outcomes of clinical trials in this field are presented which will guide patient selection. This chapter deals with the classification of the different types of atrial septal defect. It outlines the presenting symptoms of patients with this condition, and also outlines the investigations required for patient management, with the typical findings. It presents the pros and cons of percutaneous closure of an atrial septal defect with the alternative option of surgical closure. The different types of device available for ASD closure are described and discussed in detail. The outcomes of percutaneous closure are also described. The different types of device available for transcutaneous aortic valve implantation are described. The pros and cons of the different devices are discussed. The current indications for transcutaneous aortic valve implantation are outlined. The current situation regarding this technology is presented, and compared with the outcomes of open heart surgery in the high risk population. The outcomes of TAVI are also described and potential future developments in this area are discussed. The role of balloon valvuloplasty in patients who have aortic stenosis (when balloon valvuloplasty may be used prior to transcutaneous aortic valve implantation), mitral stenosis, pulmonary stenosis or tricuspid stenosis are discussed. The specific indications for balloon valvuloplasty in patients with these various structural abnormalities are described. The outcomes of balloon valvuloplasty in these different patient populations are presented. The technique of balloon valvuloplasty in these various conditions is also outlined in detail. The various types of device which involve treating the mitral valve leaflets are described. The selection of patients for treatment using these technologies are presented in detail. The pros and cons of these devices are described, together with a comparison with mitral valve repair using a surgical approach. The outcomes following treatment by percutaneous technologies are described, as are potential future developments in this area. The different types of device available using a coronary sinus approach are described. Their mechanism of action is also outlined. The selection of patients for treatment using this technology is discussed, together with the various investigations which the patients require prior to treatment. The outcomes of treating patients with these devices are presented, and potential future developments in this area are discussed. The technologies available are described, together with the techniques for their implantation. An important area is the selection of patients for these devices. The outcomes of treatment with these devices is described, and potential future developments in this area are discussed. In summary, therefore the book is clinically orientated, and provides a comprehensive and up to date description of the use of many devices in clinical practice. Since the area is rapidly evolving, the book needs to be revised at fairly frequent intervals.